This book is not open access but may be of value for those who are able to purchase it. 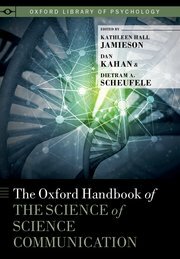 The 47 essays in the The Oxford Handbook on the Science of Science Communication focus on scientific publishing and media communications channels rather than more in depth work that engagement specialists might be involved in however, this can provide and interesting context to reflect on societal attitudes and the wider media contexts in which community engagement in global health is conducted. Whilst many examples are from the ‘Global North’ cases may be pertinent elsewhere if used critically bearing in mind the varied societal, media and historical contexts engagement with global health takes place in. The first section provides an overview of science communication and its perceived need. This examines some of the sources of scientific knowledge its relationship to the media and the affect of changing media models. As well as this the section describes wider public attitudes towards science and grounds this in some of current scientific controversies. Later in the book particular focus is given to four main controversies including “mad cow” disease in the United Kingdom but also around the introduction of the human papilloma virus and Hepatitis B vaccines. Later in the publication there is an exploration of the complexities and ethical boundaries of scientific deliberation among citizens and science-based policymaking and the position and role of organisations who may act as intermediaries in these. The final section of the book explores human biases and how these may muddy the communication and reception of scientific information if we are not conscious of them. The Handbook may be of value to researchers in science and health communication, as well as to scholars involved in research on sensitive topics or which are susceptible to miscommunication.